The other day, driving home from Kingston, I could not help but notice the sea of New York State Education Department signs (NYSED) that lined the roadside. The blue and yellow plaques are designed to alert those passing by of significant historic events that had occurred somewhere in the vicinity of the signs. These signs made me think about when I lived in Boston and followed that city’s Freedom Trail. In Western Ulster County, continuing right in to Orange County, we have the equivalent of Boston’s Freedom Trail which can be easily accessed by automobile or bicycle. While in your car or on your bike, you can absorb American history on one of the oldest roads in Western Ulster and Western Orange counties, the 104-mile Old Mine Road. Your tour begins just outside Kingston in Hurley with a NYSED plaque for Old Mine Road, today’s Route 209. The sign reads: “Old Mine Road Esopus-Minisink Trail. Indian Trail connecting Delaware Valley with Hudson River. Used before and during Revolution.” Alicia C. Batko, writing for the National Park Service says that the “Old Mine Road linked early Dutch settlements in Esopus, NY, to the Delaware River. With its southern terminus at Pahaquarry, many thought Old Mine Road was tied to copper mines worked there. However, successive attempts at those mines proved unprofitable, and today most dismiss any possibility of that as the reason for the road’s construction.” Also known as the “Trade Path, the Road to Esopus, Kings Road, and Queen’s Highway,” this road was a highway during the American Revolution to move troops and supplies. The Hudson River Valley, and notably the Hudson River itself, was a fierce battleground during the American Revolution as its control was viewed as vital for British success in suppressing the rebellion. Many of the events at the northern end of Old Mine Road relate to the last serious attempt by the British to take final control of the Hudson. Their goal was to have jurisdiction over not only a super highway, which ferried supplies and vital information to other colonies, but also to isolate New England, the heart of the rebellion. A sign just off Old Mine Road marks where Major Andre was hung. Lt. David Taylor, who was deemed a British spy, was hung from an apple tree on October 18, 1777. Old Mine Road is lined with homes connected with Revolutionary events. For example, the Van Deusen house, built in 1723, became the temporary capital of New York State after the British came ashore and sacked Kingston in October 1777. If you leave the Old Mine Road, a short distance away is a house where General Washington spoke to the people of Hurley on his way to Kingston in 1782. On Route 209 South is Oliver House where the New York State Legislature met for one month after Kingston was sacked in October 1777. Old stone houses pepper the landscape as you continue into Stone Ridge where one of the most well-known taverns in the area was located. It is linked forever to General Washington who lodged across the road in 1782. The Tack Tavern, where the New York State Judicial Branch met after the attack on Kingston, housed the commander–in-chief’s guards and aides while Washington stayed at the Cornelius Wynkoop house. 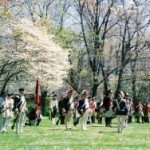 During the American Revolution and the French and Indian War, Western Ulster County through Sullivan County and into Orange County, was considered a frontier. The area south of Marbletown was particularly vulnerable, as the New York State Education signs switch from events relating to the burning of Kingston to attacks by Native Americans. As you enter Pine Bush just outside of the Hamlet of Kerhonkson, where the present day Kerhonkson-Accord First Aid Squad is located, there is a site of a Native American attack on a church (which is long gone). In 1778, the individuals were able to fortify themselves in the church to successfully fight off the raiding party. South of the 1778 attack, on a small knoll just before you start the descent into the Village of Ellenville, there was one the more famous of the Tory and Native American raids, remembered as the Fantinekill Massacre. It was here that women and children were killed and buried in 1779. After driving a short distance through Sullivan County you’ll enter Orange County. When many people think of Orange County and the American Revolution, they tend to think of the eastern part along the Hudson River. The New Windsor Cantonment, Washington’s Headquarters in Newburgh, the fall of Fort Montgomery, Mount Beacon and the Continental Ferry are all located there. However, not only did Orange share the frontier with Ulster, but also shared the Old Mine Road, and some might say, as far as the American Revolution, Orange received some of the worst of the Native American and Tory attacks. The summers of 1778 and 1779 were a tough time for the settlers living in Orange County’s frontier region. Fort Gumaer at one time sheltered settlers from both Tories and Native Americans on the vulnerable frontier. Joseph Brant’s Mohawks and Tories struck the most fear in settlers there. 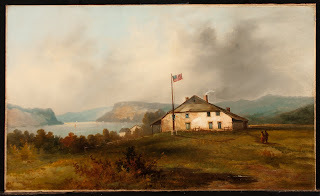 They attacked settlements near what is today the city of Port Jervis in July 1779- in the process, they burned Fort Decker which had been a refuge during the French and Indian War (a rebuilt fort can be seen today). The raiding partyies’ attacks came ended when Major General John Sullivan marched with thousands of soldiers on the Iroquois, to avenge the defeat of the militia at the earlier engagement at the Battle of Minisink. There is now renewed interest in the old Indian Trail-Old Mine Road-Route 209 byway. Brochures and books are starting to be published for historical events, day trips, and increasingly bicycle rides. 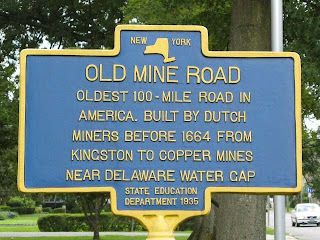 This is just a partial story of the importance that the Old Mine Road played in the history of not only New York State, but the founding of this nation as well. Photo courtesy Minisink Historical Society. Hi: I serve on the Town of Wawarsing Historical Commission and would appreciate a little information having to do with names of present day Route 209. Apparently sometime before 1922, before the 209 corridor was so designated the road must have had a name for address and postal purposes as well as for travellors especially as the sutomobile can into general usage. In the Leurenkill area there exist a road sign naming it as the Minisink Trail.